(1) The idea of a chase train for riders does two things--(A) keeps the consist of the train you are there to photograph-Pure!!! ( It also gets you to some places that might otherwise be overlooked. Now you counter by saying we can do the same by riding the regular freight, but I think there is something else to consider in that regard. If a rear pusher is used, they may not want to back-up on the hill 2 times for every runby. However, if the passenger/chase train is going first, you can leave the freight a good distance behind until everyone is set for the runby. Unload, pull the passenger train down and do a runby if you wish, and after thats over, run the freight by everyone. Then slowly back the freight just far enough to allow room for the passenger train. This way you might pick-up some locations that you would normally skip. I am thinking of Chama-Cumbres. If you have a siding to work with you can flip the train order if you wish during the day. There might be some places like near Hamilton's point that would make a good runby location, or between the crossing at Coxo and the big curve. Maybe do limited runbys but they would be good ones. 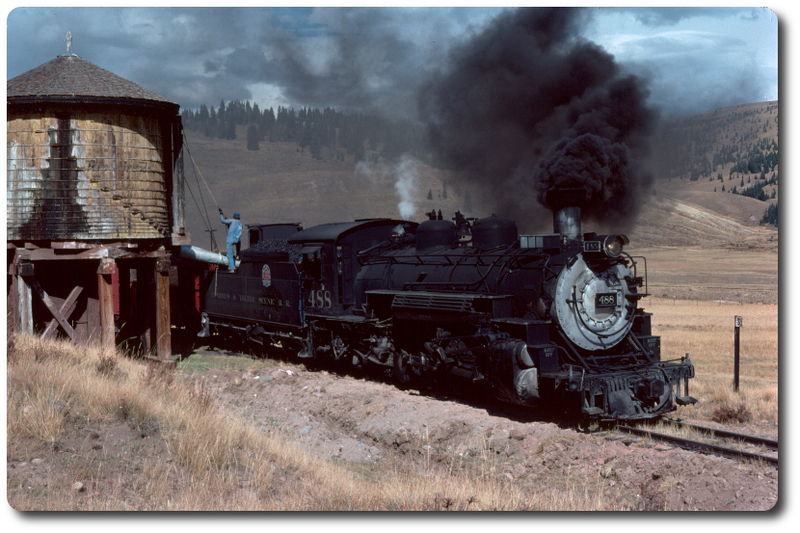 Or chase it to Cumbres and board there, but have the chase train at Cumbres to go east, and back west the next day. Once you reach Cumbres on the second day its all downgrade anyway, and anti-climactic as far as photos are concerned. If some want to chase down to Chama they can do so in their own cars. (2) Also if you are trying to do a prototypical freight for 1968, you cannot use any of the tank cars, cause they didn't use them after 1964. Outfit cars that were used in the sixties were mainly grey so they don't really work either, except for folks on the chase train if you need them. Just remember it takes about 6 hours of straight running to cover the 64 miles, and there are meal stops, water stops, and back-up moves. A big mistake for rookie organizers is to think you can do tons of runbys in one day. Anyway some food for thought that doesn't cost you a dime!! !